Discover the secrets of Ragnvald. Word for the Kyne's Peace shout. According to legend, the ancient ruin of Ragnvald was once populated by Nords and ruled by a fearsome chieftain named Otar. At some point, Otar went mad due to evil voices within his head and turned into a servant of the ancient dragons, causing havoc and leading to dark times in Ragnvald. Eventually, the Nords decided to stop Otar and sent in two champions, Torsten and Saerek. Although they couldn't destroy him, they managed to seal him off inside the ruin, using separate keys to ensure he never escaped from his containment. 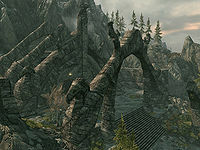 Ragnvald has long since been abandoned, but the Markarth guards are aware of the dangers lurking within, and will rightfully warn you about the place: "There's an evil to the north, friend, and its name is Ragnvald. A tomb like so many in Skyrim, where the dead have found no peace." Straight north of Salvius Farm, an unmarked path will start in the middle of nowhere, leading directly to the huge exterior area of Ragnvald. The ruin is only guarded by two draugr enemies, but the area is otherwise devoid of life and sound. Enter Ragnvald Temple through the main gate and proceed through the nearly destroyed first chamber with a dead draugr on a table. Take the only available path downwards and keep an eye out for helpful potions and minor loot along the way. The path will eventually lead to a large, complex chamber guarded by three leveled draugr. Fight them and proceed in a western direction until you face an odd-looking sarcophagus in front of a set of stairs leading to sealed area. Touch one of the empty slots and read the inscription. The quest will trigger at this point and add map markers to the two items needed, located in different zones within Ragnvald. As told in the legend, the next step is to claim Saerek's Skull Key and Torsten's Skull Key from the heroes that managed to seal off Otar the Mad back in ancient times. The two guardians still protect the keys with their lives, and you will have to fight both of them to complete this quest. Check the map markers for doors leading in two different directions and choose which zone to enter first, Ragnvald Canal or Ragnvald Crypts. The door opens to a huge water-filled room guarded by three leveled draugr enemies. Follow the stream as it bends, making sure to surface in the alcove halfway through for a boss-leveled chest behind a door, but beware of the hidden flamethrower trap activated when you touch the door; it can be deactivated by pulling the nearby handle. Proceed west and head up the bridge where a small crack in the woodworks will allow you to proceed forward. Follow the path until you reach a large open area, with Torsten's Skull Key on a pedestal. Claim the skull, which will cause Guardian Torsten to burst out of his sarcophagus, along with two leveled draugr. Finish the fight, examine the room for loot, then return to the pedestal and cross the bridge leading east. This is a shortcut back to Ragnvald Temple, although you will have to traverse a hallway full of swinging blade traps. Head down the wooden bridge and fight the lonely draugr guarding the first room. Two paths leads south, both of them ending in the same chamber, although the one on the left is filled with traps triggered by pressure plates. 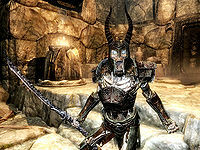 In the crypts, a total of five draugr will awaken from their slumber and attack. In the next chamber is an oil slick which can be used to damage the enemies that inhabit it. Examine the alcove for the Restoration skill book Mystery of Talara, v2 in front of the booby-trapped minor loot chest, then head up the stairs to the north. You will emerge on the level above, with free access to Saerek's Skull Key on an alcove to the east. 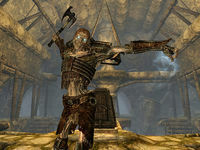 As soon as you take it, Guardian Saerek will burst forth, accompanied by two draugr from the alcoves above. Defeat the guardians and backtrack west over the bridge, a quick shortcut back to Ragnvald Temple. With both Skull Keys in your possession, return to the sealed sarcophagus in the eastern part of Ragnvald Temple and insert them into the empty slots. The locks will then disappear, and before long, Dragon Priest Otar the Mad will emerge. Otar uses shock as his primary weapon. He tends to summon a storm atronach in the beginning of the fight, and he also uses the unique Staff of the Storm Wall with very high Shock damage. Otar will rarely follow you if you stay away from him, but he will bombard you with his staff that casts Wall of Storms. Otar does use the Thu'um, but he only uses Disarm. The Unrelenting Force shout is ineffective against him. He can prove to be a challenging enemy to face, especially at low levels. After the battle, it is time for your reward. From Otar's corpse, claim his valuable staff, the Dragon Priest Mask Otar with resist shock, fire and frost enchantments, along with a huge amount of gold. In the chamber behind the sarcophagus, the boss-leveled chest holds even more gold, while the word wall in the back of the chamber provides a word for the Kyne's Peace shout. When all is said and done, reclaim the two Skull Keys from the sarcophagus, as they can be sold for a high price, and exit Ragnvald the way you came. The book The Secrets of Ragnvald is present in the game files, but can not be found anywhere in the game. Using a hostile spell on Otar's casket while you have both skull keys in your inventory (or one in your inventory and one used on the casket), will cause the casket to open prematurely, and Otar to emerge and attack. Sometimes the gate to the word wall area will close straight after opening. ? The following empty quest stages were omitted from the table: 0, 1, 2, 20, 30, 40. 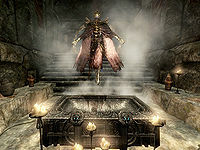 On the PC, it is possible to use the console to advance through the quest by entering setstage dunRagnvaldQST stage, where stage is the number of the stage you wish to complete. It is not possible to un-complete (i.e. go back) quest stages, but it is possible to clear all stages of the quest using resetquest dunRagnvaldQST. This page was last modified on 25 July 2018, at 01:58.